Ling's moment Handmade Bohemian Dream Catcher fairy lights come ready to use. 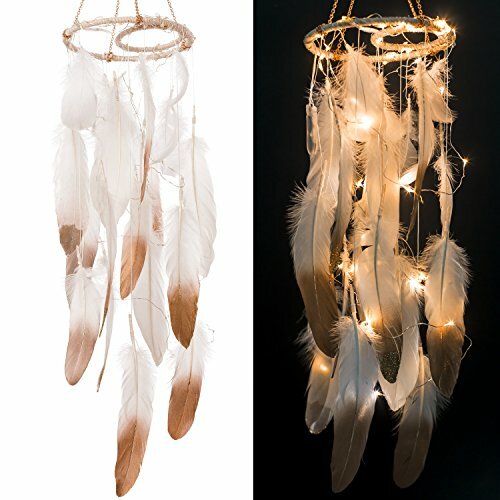 It features gold dipped feathers and copper wire LED fairy string lights. The lights are portable and batteries are included. Ship By Amazon Only. So you will Get By Superior Service. Notes: Cuz battery operated, so it's non water-proof. Cuz handmade product, so every one may has size difference. Remind:When you received our Dream Catcher, do not forget to take out the insulation spacer in battery case. Ready to Hang: Fully assembled. No DIY Required.